[124 Pages Report] The market size of continuous laminated FRP panels & sheets was USD 740.0 Million in 2015 and is projected to reach USD 1,084.7 Million by 2021, registering a CAGR of 6.53% between 2016 and 2021. In this study, 2015 is considered as the base year and 2016–2021 as the forecast period for the FRP panels & sheets market. In this research report, the market has been categorized based on applications and region. Revenue growth forecasts and analysis of trends in each of the submarkets are also provided in the report. The report estimates the market size and growth potential of the FRP panels & sheets market manufactured by continuous lamination process, in terms of value (USD million) and volume (million square feet). 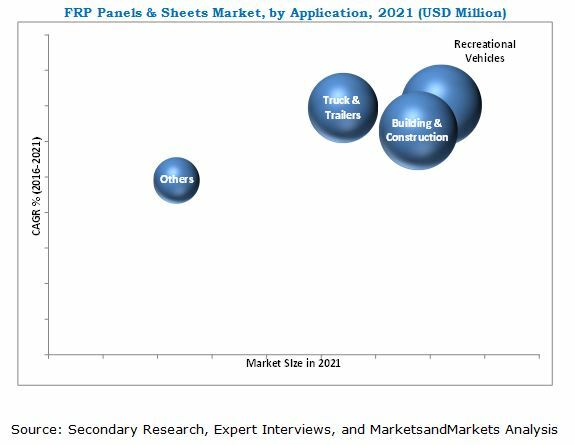 The reports also analyze the global market of FRP panels & sheets by application (recreational vehicles, building & construction, truck & trailers, and others) and region (North America, Europe, Asia-Pacific, and RoW). The study covers detailed information regarding the key factors such as drivers, restraints, opportunities, and challenges, which are influencing the market growth. It strategically profile key players and analyze their core competencies. Different secondary sources such as company websites, encyclopedias, directories, and databases have been used to identify and collect information that is useful for this extensive commercial study of the global FRP panels & sheets market. The primary sources, which include experts from related industries, have been interviewed to verify and collect critical information as well as assess the future prospects of the market. The top-down approach has been implemented to validate the market size, in terms of value and volume. With the data triangulation procedure and validation of data through primaries, the exact values of the overall parent market size and individual market sizes have been determined and confirmed in this study. The market for FRP panels & sheets has a diversified and established ecosystem of its upstream players such as raw material suppliers and downstream stakeholders such as manufacturers, vendors, end users, and government organizations. Most of the major players in the FRP panels & sheets market have backward and forward integration to strengthen their position in the market. Some of the manufacturers of FRP panels & sheets include Crane Composites Inc. (U.S.), Glasteel Inc. (U.S.), U.S. Liner Company (U.S.), Brianza Plastica SpA (Italy), Optiplan GmbH (Germany), Polser Fiberglass Reinforced Plastics Inc. (Turkey), Panolam Industries International Inc. (U.S.), LAMILUX Heinrich Strunz Group (Germany), and others. “This study answers several questions for the stakeholders, primarily which market segments to focus in next two to five years for prioritizing the efforts and investments”. 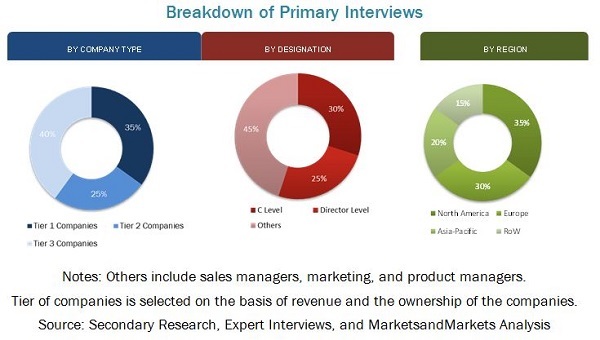 This research report categorizes the FRP panels & sheets market based on application and region and forecasts revenue growth and analysis of trends in each of the submarkets. The market size of continuous laminated FRP panels & sheets is projected to reach USD 1,084.7 Million by 2021, at a CAGR of 6.53% between 2016 and 2021. The growing manufacturing industries and continuous new product launches, partnerships, expansions, and mergers & acquisitions undertaken by various companies are the key growing factors of the global FRP panels & sheets market. The recreational vehicles industry is projected to be the fastest-growing application in the FRP panels & sheets market between 2016 and 2021. This growth is attributed to growing demand for recreational vehicles owing low fuel prices and interest rates, rise in number of baby boomers, improved economy, rising costs of airlines, and gaining popularity for outdoor activities, such as camping, tailgating, and sports events. With the increase in demand for recreational vehicles, the demand for FRP panels & sheets is also rising owing to their lightweight, high performance, and low maintenance cost than other traditional materials. North America, being the largest market for FRP panels & sheets, is projected to register the highest CAGR, in terms of value and volume, between 2016 and 2021. This growth is mainly attributed to rising demand for superior performance materials from recreational vehicles, building & construction, and truck & trailers application. It is also backed by increasing new product launches and other development strategies in the region. Contributions of various research organizations to R&D and enhancement of commercialization of FRP panels & sheets are some of the key growth factors driving the market in North America. The market for continuous laminated FRP panels & sheets is rapidly gaining importance; however, few factors, such as capital-intensiveness of the industry, availability of low-cost substitutes, and high initial and production costs are some of the major challenges and restraints faced by the FRP panels & sheets market. Crane Composites Inc. (U.S.) is one of the major manufacturers of FRP panels & sheets. The company's engineering and product development activities are directed primarily towards development of new products, improvement of existing products and adaptation of existing products to particular customer requirements. Thus, the strong focus on product development helps Crane Composites Inc. to maintain its industry leading positions in attractive niche markets. 11.7 Polser Fiberglass Reinforced Plastics Inc.